The procedure for adjusting the display settings of the screen differs depending on the type of screen present on the vehicle. Firmly apply the brake and place the shift lever in R (reverse). The screen will display the Brightness settings. Turn the TUNE/FOLDER knob to adjust the setting up or down. 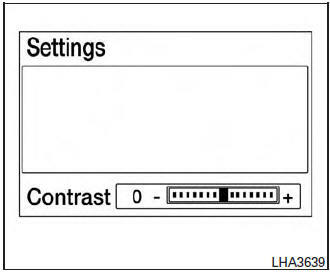 Press the ENTER/SETTING button again to display the Contrast settings. Press the ENTER/SETTING button to complete the adjustment. NOTE: Do not adjust any of the display settings of the RearView Monitor while the vehicle is moving. Make sure the parking brake is firmly applied.